A young Korean girl finds a way to enjoy a traditional dish. Yoomi, her brothers, and their grandmother are anthropomorphic cats. On a rainy day, Grandma calls the children down for lunch. 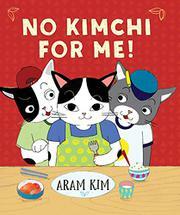 Yoomi likes most foods that Grandma prepares, but she just doesn’t care for kimchi. Her older siblings use this against her, calling her a “baby” and excluding her from their after-lunch activities. Yoomi tries on her own to find a combination of foods that will make the spicy, fermented dish palatable, but cookies, pizza, and ice cream don’t do the trick. Grandma’s solution is to prepare a (savory) kimchi pancake; the author’s mother’s recipe for this delicacy is appended. Kim’s straightforward text conveys the actions and reactions of her characters clearly. The illustrations, created with pencil, colored pencils, and pastels on paper, then assembled digitally, vary in size and placement, adding interest and flow to the story. Distinctive patterns, unusual perspectives, and intriguing details add to their appeal. While the featured food may be unfamiliar to some listeners, the family dynamics will ring true. The final page, complete with a rainbow, may cast a more rosy than realistic light on the resolution of typical sibling squabbles, but readers, like Yoomi, will appreciate this minor triumph.